The quality and characteristics of sea salt depend on the quality of its providence as well as on its degree of refinement. 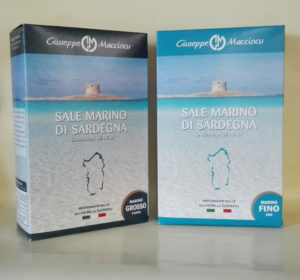 Originating from the uncontaminated waters of the crystal sea of Sardinia located within a regional Park, thanks to the actions of the wind and the sun, our salt develops in a totally natural way rendering an exceptional organoleptic quality. It is free from chemical additives and rich in precious oligo-elements that are fundamental for our organism. Seeing as it is processed in an artisanal manner it retains all its precious minerals (iodine, zinc, bromide, calcium, sodium, magnesium, potassium, fluoride, phosphorus etc.) unaltered. Supply: Bundles of 20 pieces.